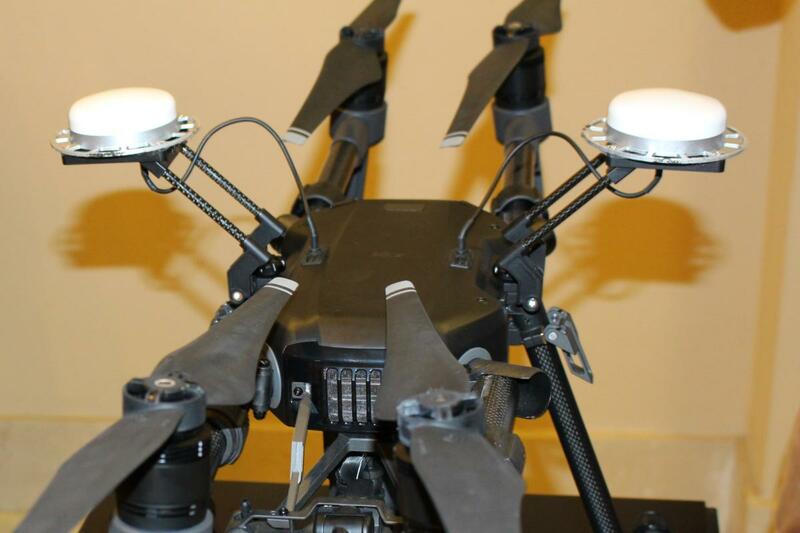 Regular drones suffer in rain, wind, or extreme temperatures, but not these. Drone leader DJI introduced its M200 series of rugged drones on a windy mountaintop overlooking the city of Barcelona, on the Sunday before Mobile World Congress. This was the perfect place to show them off: The entry-level M200, and the higher-end M210 and M210RTK, may not have all the gewgaws of the company’s Inspire and Matrice models for professional photography, but they can operate in harsher conditions, making them indispensable to industries like construction and utilities, as well as field researchers and first responders. These demanding customers will be the first to get the M200 series when the drones ship in the second quarter. Prices haven’t been announced, but the drones will be sold through dealers, meaning there’ll be no doorbusters. The dream, of course, is that some of the coolest features will someday trickle down to the more attainable Mavic or Phantom consumer lines. DJI’s M200 is the entry-level model in its Matrice 200 series, with just one gimbal. IP43 rating: ‘IP’ is short for International Protection Rating and refers to the drone’s ability to withstand intrusion to its enclosure. The M200 series’ rating of IP43 means it’s weather- and dust-resistant. In real terms, that means it can handle rain (but not a dunking), and sand or dusty conditions, provided it gets a good cleaning and inspection afterward. Dual IMUs: ‘IMU’ stands for inertial measurement unit, a device that can monitor the stability of the drone and keep it on an even keel, and adjust the flight path based on sensors. This is especially useful for high-wind conditions, where many drones may be buffeted or blown off course. Triple barometers: The barometers can track the altitude of the drone more accurately than GPS can. Dual frequencies: The M200 series drones can switch between the 2.4GHz and 5.8GHz bands to avoid excessive interference. 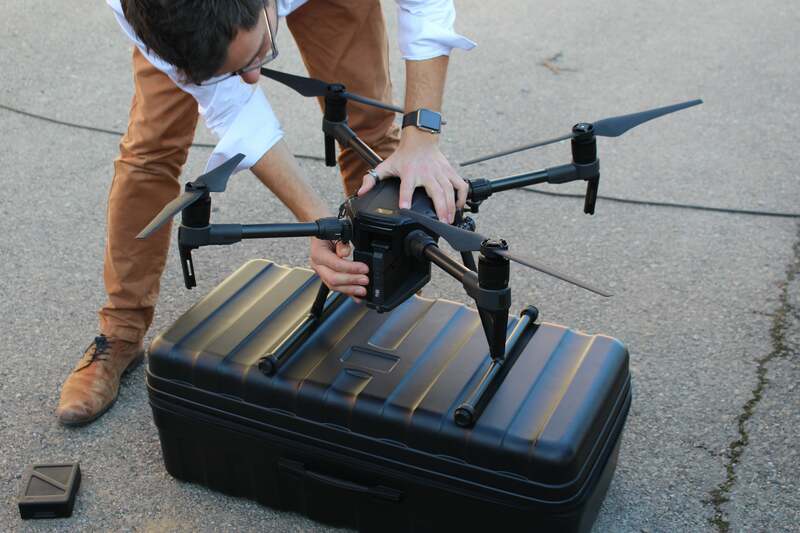 A DJI staffer checks the dual battery packs on an M200 series drone. Dual redundant, self-heating batteries: Other drones have more than two batteries, but with the M200’s redundant pair, one can take over if the other fails, and one can run the unit while you swap out the other. Assuming no such needs, the batteries provide a maximum flight time of 35 minutes. You can set the batteries to heat themselves so they can better maintain charge in colder weather. 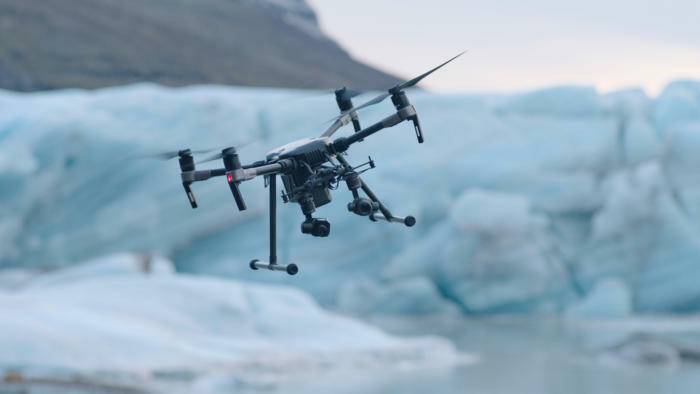 The M200 series drones can operate in temperatures as cold as -4 degrees Fahrenheit. Built-in ADS-B receiver: No one wants a drone to fly into the path of an airplane or helicopter. By integrating an ADS-B receiver (which the company calls DJI AirSense) into its M200 series drones, DJI lets drone pilots receive key information about nearby aircraft (assuming they also have ADS-B), so they can steer clear. Sensors, sensors, and more sensors: The M200 drones integrate numerous sensors to interpret its environment. 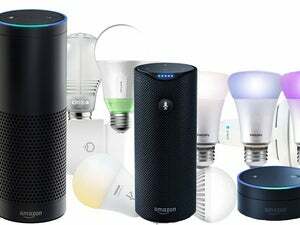 Highlights include forward-facing image sensors that act much like human eyes, providing a stereoscopic view so they get a sense of depth for avoiding front obstacles. On the bottom of its body, downward-facing and ultrasonic sensors help it navigate and even remember ground topography, so it could find its launching area by eyeballing it, so to speak. An upward-facing infrared sensor alerts it to objects or structures overhead. One of DJI’s new M200 series drones took off to inspect a utility antenna. The drone we observed used these and other sensors to keep its distance from the Telefonica antenna. The same sensors could be used to help it navigate a warehouse’s maze of stacks, or go around trees. Multiple gimbals: Most drones have just one gimbal to stabilize one camera in its underbelly. The M200 drone has one bottom gimbal, but the higher-end M210 and M210RTK have three, to accomodate one camera on top or two on the bottom (it can’t carry all three). A top camera could let the drone more easily inspect a bridge, for example, while dual cameras on the bottom could record, say, zoom and thermal images simultaneously. Real-Time Kinematics: RTK is a very precise form of satellite navigation. DJI’s own version is called D-RTK, and the M210RTK drone has two of these modules (the white puck-like components pictured below) so it can navigate with greater accuracy. 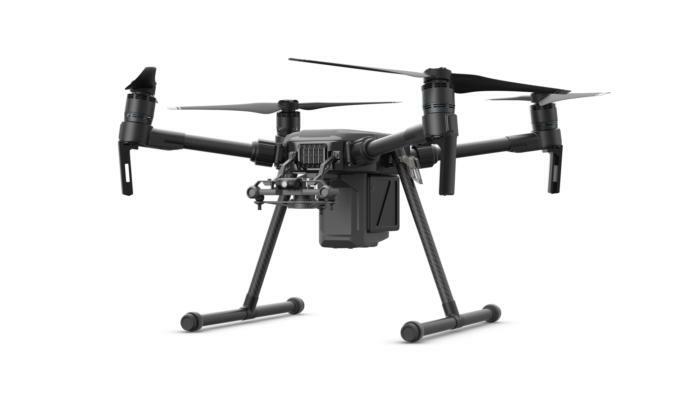 DJI’s Matrice 200 series drones includes the M210RTK, with dual D-RTK modules for precise 3D navigation. With these and other features, the M200 series prototypes we observed could hover, fly, and maneuver with impressive steadiness, especially given the strong winds on that mountain. 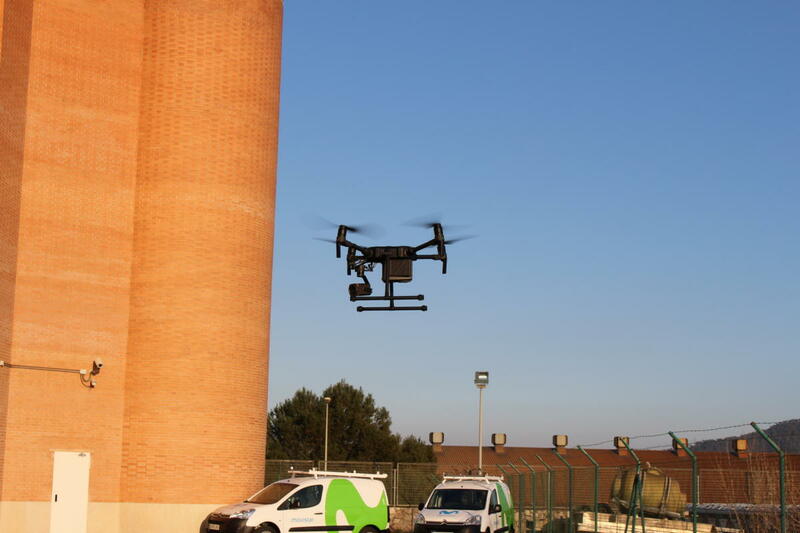 An M210 drone inspected the Telefonica antenna using DJI’s new Zenmuse Z30, a 30x optical/6X digital zoom camera, so it wouldn’t have to get too close. DJI is well-known for making its drones easy to use. As we all took turns maneuvering the drones using small joysticks and a tablet app, I couldn’t help but feel I trained for this while playing Atari games. But these drones are not for child’s play, and they could be inspecting antennas in your area soon.